This page will guide you to extend space of C drive when it runs on low disk space on RAID 5 on Windows Server 2008. Download IM-Magic Partition Resizer Server to increase sizes of Windows Server 2008 C drive that has low disk space on RAID 5. If you encounter low disk space problem on C drive on Windows Server 2008 RAID 5, you can rely on professional partition software to resize the RAID 5 partition. 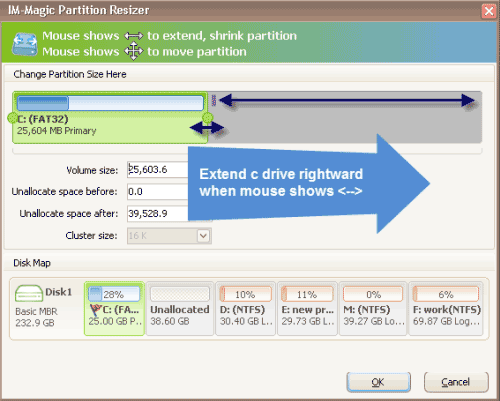 IM-Magic Partition Resizer Server enables you increase size of C drive without rebuilding array. You can run this partition software to add unallocated space to the C drive when it is running on low disk space. This partition software can work on Windows Server 2008, SBS 2008, Windows Server 2008 R2 and other Windows Servers to resize disk partition without deleting or moving original data. Move the arrows to shrink the selected partition so that you can get some unallocated space. You need to move the unallocated space close to C drive. Right click the C drive and choose "Resize/Move" option. Move the arrows to add the unallocated space to C drive and click "Apply" button. "I received low disk space warning message on the C drive on RAID 5 on my PC which runs in Windows Server 2008. I didn't think that it's a problem as long as I no longer save any data to the partition. However, recently my PC reports the low disk space warning message more and more frequently. Although I have not stored any data to the C drive after the first time I received the low disk space alert message, C drive has no free space. Can I fix the low disk space on Windows Server 2008 C drive on RAID 5?" "Hello! I need to resize RAID 5 C drive in Windows 2008 because system reports low disk space warning. Do I need to rebuild the array in order to reallocate disk space? Is there any easy way to extend C drive space on Windows 2008 RAID 5?" Truthfully, you need to rebuild array if you want to resize disk partition on RAID 5. However, if you can use the partition software, you can extend C drive on RAID 5 without rebuilding array. 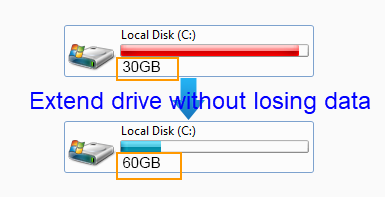 You just need to move free space from another partition to the C drive so as to extend its space. You can move free space from existing partition on the RAID 5 array. Or you can also add new disk to increase the C drive on RAID 5. You should make sure if the array can be compatible with the new added disk when you want to add it to extend C drive. This partition software can work on Windows Server 2008 perfectly. As a matter of fact, you can resize disk partition on Windows Server 2008 even if you do not use a partition tool, because Windows Server 2008 built-in Disk Management has the function of resizing disk partition. You can open the Disk Management and select a partition that has much free space. Then, you can right click this partition and choose Shrink Volume to squeeze some unallocated space. Then, you can add the unallocated space to C drive. Disk Management works similarly as the professional partition software, but the only limitation is that Disk Management cannot move partition. After shrinking the partition that has much free space, you still need to move the unallocated space close to C drive if you want to add the space to C drive.